In case you are curious what the word gaudy means - (like I was) - it is more modernly defined as meaning "brilliantly or excessively showy" or "ostentatiously ornamented." Looking up a difference source I discovered that "gaudy" derives from the Latin gaudium and Old French gaudie, meaning "merry-making" or "enjoyment". The story is set at the all-female Shrewsbury College in Oxford. Our protagonist, Harriet Vane, has been invited to attend the college's Gaudy Night party. The stage being set, we next meet the crime. Immediately following the Gaudy Night party, college students and faculty are being threatened anonymously with obscene graffiti and malicious pranks. Fearing to bring the wrong kind of attention to their burgeoning women's college, the faculty calls on Harriet Vane to assist in determining who is making these anonymous threats. Of course, this being a mystery, I can't reveal much about the story without spoiling the plot so my description of the book will be short. Suffice it to say, I found it to be an enjoyable read. My cravings for a good mystery were completely satisfied. What was possibly more interesting to me than the mystery itself was the way that Sayers argues intellectually with her reader throughout the book. Her characters are academics in Oxford who love to pose questions and make arguments. There is a heavy, almost exclusive emphasis in this book on the rights of women to pursue and receive a higher education. The book was published in 1935 at a time in history when women more commonly remained "in the home". At this same time, opportunities and careers were being made more available for them. 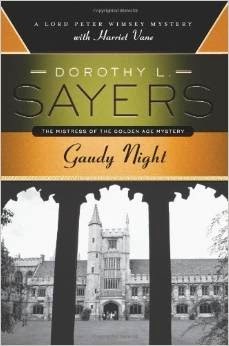 As a result of Sayers' arguments and as an interesting historical note, Gaudy Night is labeled the "first feminist mystery novel." Certainly more modern readers take for granted the opportunities which are readily available to women these days, but Sayers was working in a world which was primarily dominated by men. It is fascinating to read her arguments for "women's rights" (that's not what she called it; it's what we call it) to pursue vocations outside the home. Poignantly she uses a college setting to argue her point (more effectively). Doing just a tiny bit of online research I discovered the Sayers herself was involved in the struggle to allow females to study at Oxford. In this book the women's college had just recently been granted the right to exist, hence their desire not to draw negative attention to themselves. The Dean and the staff wished to solve the mystery without bad press; they did not wish to be viewed as catty and troublesome. Vane's role is to help maintain the reputation of the college as much as it is to solve the mystery. Irony is in the subplot. One of Sayers' other popular literary characters is Lord Peter Whimsey and when push comes to shove and Vane is suffering some difficulty in discovering who the perpetrator of the crimes is, she finds herself with a strong desire to consult with Whimsey. He makes an appearance but also engages with the arguments for "a woman's place" in society and in the world. From a historical perspective, this book is interesting to read. From the perspective of enjoying a good mystery, this book also makes for a very satisfying read. I must also say that from the perspective of one who gets a huge kick out of wit and irony, I found Sayers to be a positively brilliant writer and I enjoyed her immensely. There are plenty of people out there that can make a much more intelligent argument as to why you should read Sayers, I am quite certain. There are people who could tell you a great deal more about her work and her passions. There are people who love to do nothing more but argue with and for Sayers and her passions. I know next to nothing except that I found her to be a marvelous story teller who has a clever way of writing which caused me to chuckle on more than one occasion. For me, that's all that I was looking for in a mystery. Yes, I am curious to read more about her and more of her books. I can only imagine that I will be reading more Sayers in the future. Particularly if my friend Joy has anything to do with it. For now, I'm content to have read this one and thank Joy for the opportunity of doing so! This book sounds so interesting and isn't something I would ever have found on my own. Thanks for the recommendation! I've enjoyed Christie's mysteries so much, I've been wanting to try out some of the other mystery authors from the past, like Heyer and Sayers. I'll pull this title to the top of my "mystery" reading list! Sayers is one of those names I've wanted to read some day but never have yet. Thanks for sharing more about her. I love the idea of the book exchange and then meeting to discuss the books we gave/received! !